The UAV weaponization trend does not stop at the Predator and Reaper. After the CIA, the U.S. Air Force and Army, as the U.S. Marine Corps, all wish to arm its unmanned aircraft to carry weapons. However, the Marines own only small UAVs that currently are not equipped to carry weapons. The FireScout unmanned helicopter will be able to carry missiles and rockets, but it lacks stealth, characterizing smaller UAS. The first system considered for such role is the RQ-7 Shadow, which will soon be modified to perform armed missions. As part of the recent upgrade, its wings were strengthened and extended, matched with an engine running on heavy fuel, providing the Shadow more endurance and payload. 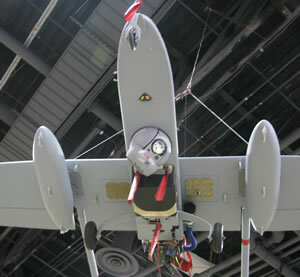 The EO payload was enhanced with the introduction of IAI/Tamam POP300D Multi-sensor payload carrying day-and-night sensors with an integral laser designator, enabling the Shadow to designate targets for other platforms and, more specifically, ‘self designate’ targets for the missiles carried on-board. 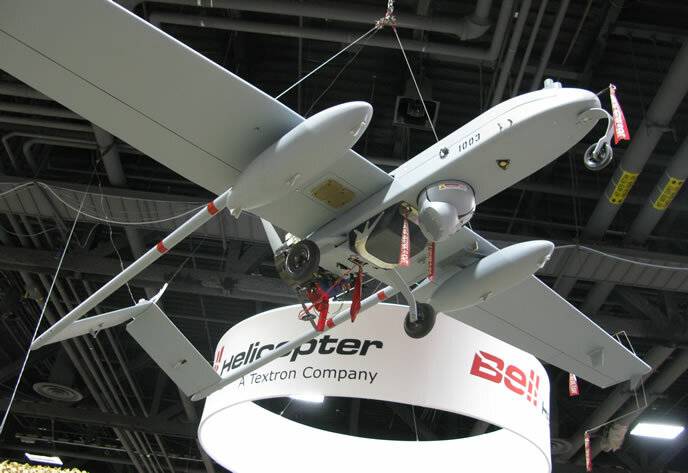 The new payload was visible with multiple Shadow UAVs displayed at the recent AUSA event. The new designators are provided as part of a $70 million contract awarded to the Shadow manufacturer AAI to equip the Army and Marine Corps fleet of Shadows with 142 laser designation kits. 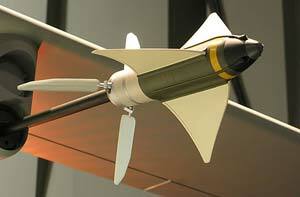 A typical weapon-load for the Shadow will take only two missiles – one under each wing. Available weapons include the ‘Griffin’ Small Tactical Munition (STM), developed by Raytheon or the Viper Strike from Northrop Grumman. The Israeli Lahat missile, developed by IAI could also be considered for such application. Other options for unpowered weapons are guided mortar bombs. Few months ago General Dynamics demonstrated how such a weapon can be dropped from a UAV, using a new, lightweight ejector rack developed by the company. 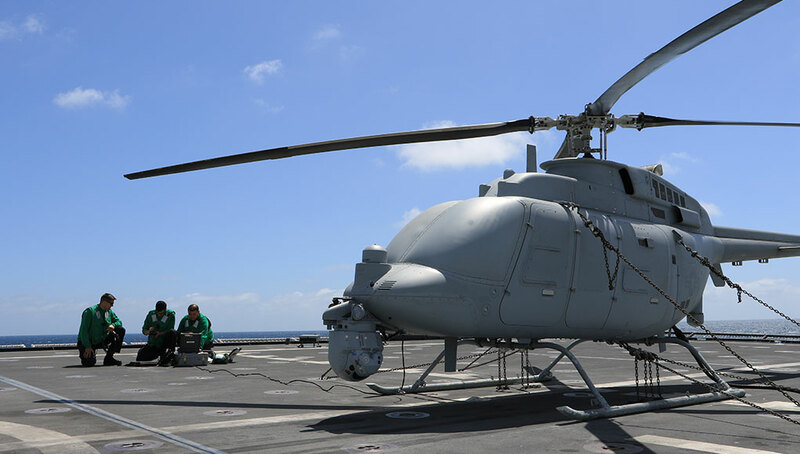 Other weapons being matured for UAVs are 68mm guided rockets, although due to the weight of the launcher and auxiliary controls, these rockets are not suitable for small drones, but could be carried by the MQ-8B FireScout, as they are more suitable for manned helicopters or light aircraft. These are already designed to carry unguided rockets – primarily light armed scout and attack helicopters like the Apache, Kiowa warrior and new AH6i. Laser guided rockets are currently offered by several manufacturers, including Raytheon, BAE systems, Lockheed Martin and ATK. Flying armed reconnaissance missions with a small unmanned platform like the Shadow presents quite a challenge. Even when the UAV has enough payload capacity for the missiles, additional issues to be considered, include communications delays. These would hardly go unnoticed by ISR analysts, but could lead to bitter failures, or even cause unacceptable collateral damage. Laser designating payloads that draw considerable power from the generator are normally operated on larger drones, but on a small platform they draw much of the reserve power on board. Furthermore, additional payload-control modules are required to manage the expendable payload. Larger UAVs commonly use a distributed payload controllers as part of their avionic architecture, but a small UAV lacking such system would require the integration of dedicated avionic interfaces and wiring for each weapons rack. A weapon management system (WMS) system developed by the U.S. The Naval Air Warfare Center Weapons Division (NAWCWD) provides such integration on RQ-7B Shadow class UAVs for the miniature Spike missile developed at the center. 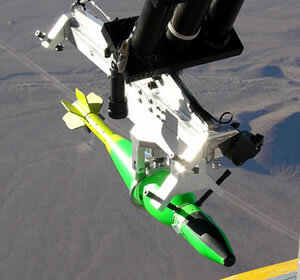 The system comprises a Weapon Management System, rack launcher, with the missile being tested on a small UAV. The second generation WMS weighs about 2 pounds (less than 1 kg). It can control four stores points, two video streams, a digital recorder and a link to other avionic system through a MiL1553 bus interface. believed to be Lased Beside the Spike, NAWCWD is planning to expand the system to support the new Scan Eagle Guided Munition (SEGM) and the Miniature GPS-Guided Munition (G2M), both undergoing development at China Lake Naval Weapons Center. Employment of GPS-guided weaponry can reduce the complexity of target acquisition, as they do not require continuous target designation. The weapon relies on accurate target coordinates, guiding itself to the precise location through autonomous or ‘man in the loop’ engagement. 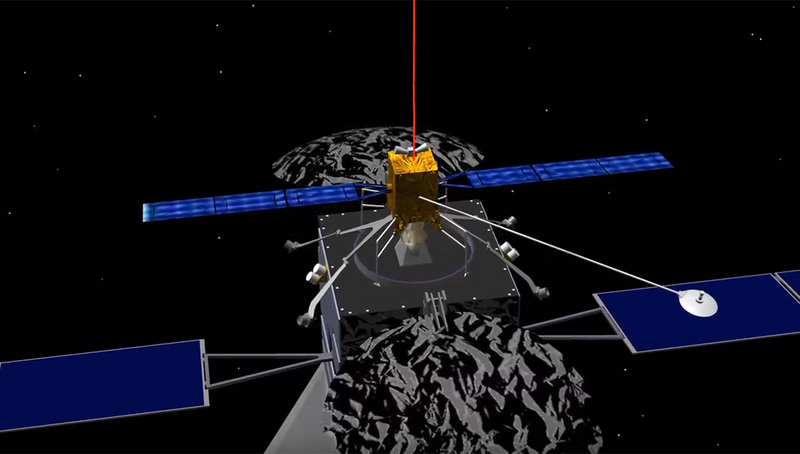 This capability could be further assisted by semi-active laser homing, where ground elements are available to designate the target from the ground. 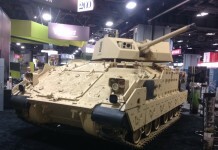 Information about the G2M is vague, but a glimpse of what such a weapon could look like was provided during the recent AUSA exhibition in Washington last October by ATK. 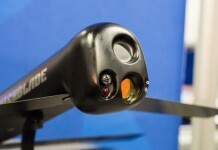 The company displayed a new, unpowered light-weight guided weapon designed specifically for small UAVs, or as a submunition payload carried by larger UAVs, or ‘cargo’ type weapons. In 2012 ATK disclosed the weapons’ name as ‘Hatchet’. Four such GPS/laser-guided weapons are carried in two streamlined fairings, attached under the wing of a Shadow. Each weapon weighs about 6 lbs (2.7kg) and packs the seeker, warhead and electronics, weighing a total of 4 pounds (1.8 kg); the remaining weight is reserved for the electronics, airframe and flight control surfaces. The launch signature is minimal, as the weapon does not use any propellant when released into the airstream. Diving silently along a glide slope determined to acquire the laser signal reflected from the designated target, the weapon can develop substantial offset from the flight path, reaching targets at significant standoff distance from the UAV, to achieve maximum surprise. The Shadow is positioned to be the first platform to carry the small weapon, but ATK plans to offer the new miniature weapon for other platforms, providing persistent close air – support on demand. 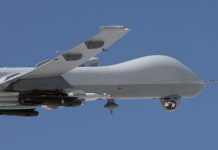 Typical load on a Predator UAV could be 72 units, while the Reaper could carry 270 such weapons. For some applications, even a miniature weapon like the Spike could be too large for the job. Such missions could employ miniature ‘suicide’ drones. Several programs pursuing such capabilities are currently underway. In a recent test was carried earlier in 2010 at Ft. Sill, where an 81mm Air-Dropped Guided Mortar (ADM) bomb was deployed from an aircraft. 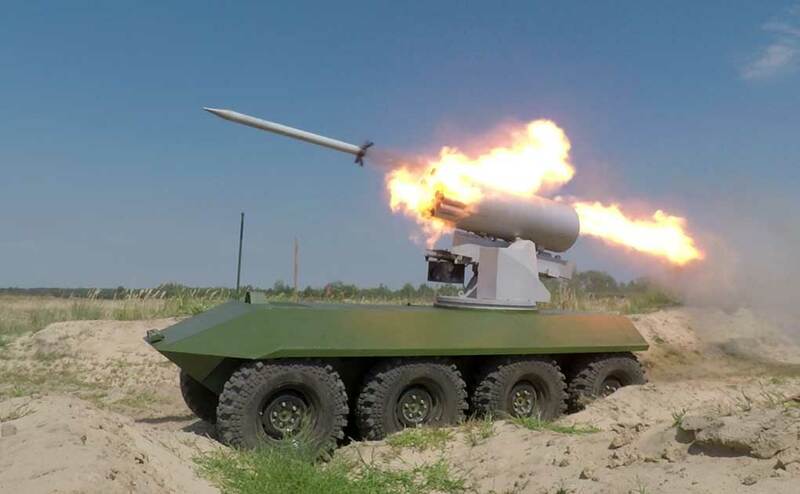 The interface with the launching platform was provided by the 'Smart Rack' carriage and release system, also developed by General Dynamics, enabling the weaponization of any tactical unmanned aerial vehicle (TUAV) platform. Photo: General Dynamics OTS.